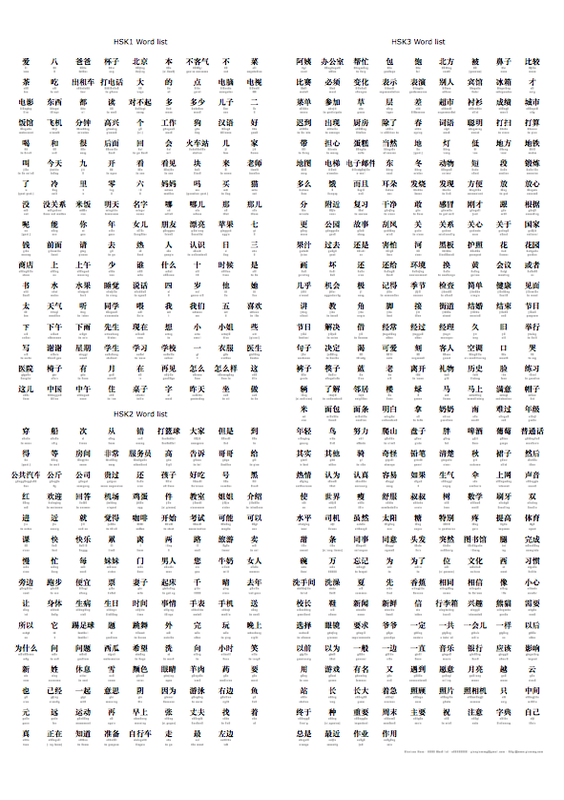 The PDFs are posters with the list of HSK words, for levels 1,2,3,4. DOWNLOAD The HSK1 word list: it contains the list of HSK level 1 words. The best results are obtained printing on A3 format. 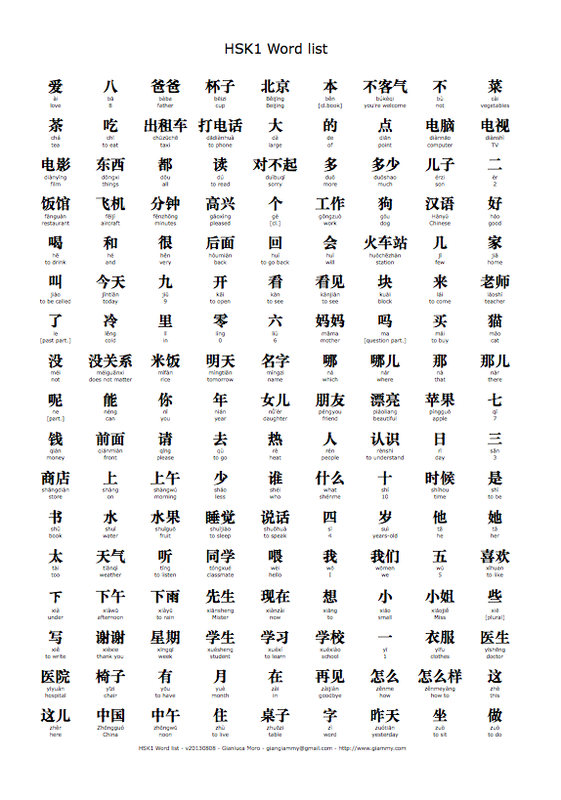 The HSK123 word list: it contains the list of HSK level 1,2,3 words. The best results are obtained printing on A1 format. The HSK4 incremental word list (beta release :-): it contains the list of HSK level 4 words not included in the HSK123 poster. It is NOT the complete HSK4 word list: to have the complete list you need BOTH HSK123 and HSK4 posters! The best results are obtained printing on A1 format. wordlist1234.txt A reference, with the list of words present in the poster: it is a PLAIN TEXT FILE IN UTF-8 FORMAT; save to your computer and open with an editor supporting UTF-8 format - and chinese characters, of course! The HSK123 poster has the same structure of HSK1 poster (chinese characters with pinyin and english translation): the upper left side is the same as the HSK1 poster, the lower left side shows the HSK2 incremental word list, the right side shows the incremental HSK3 word list. The HSK4 poster shows all the word on HSK exam, level 4, excluding the one already present in previous levels. It is classified beta release, as the author is still studying the words of this level! DOWNLOAD 50-Essential-Chengyu-Chinese-Idioms-Made-Simple.pdf: if you do not know what Chengyu is, probably you do not need this file, but if you are really curious, just download and read it.